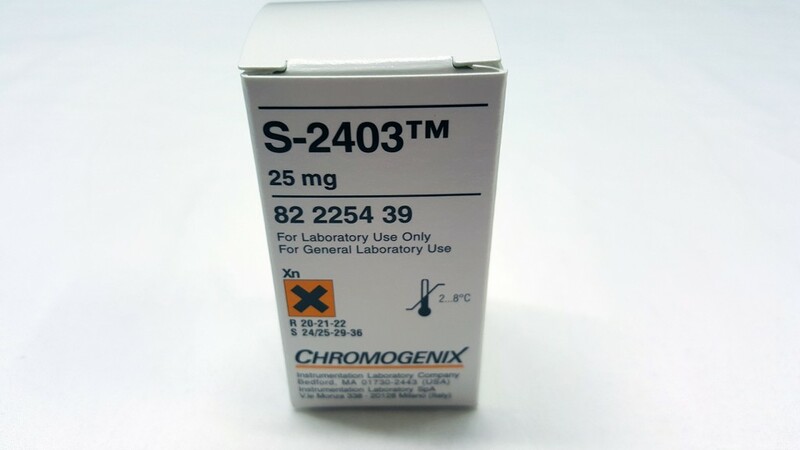 Chromogenix S-2403™ is a chromogenic substrate for plasmin and streptokinase-activated plasminogen. Each vial contains the chromogenic substrate S-2403™ 25 mg and mannitol 60 mg as a bulking agent. Stability: Substance: Stable until expiry date if stored at 2-8°C. Avoid exposure to light. The substance is hygroscopic and should be stored dry. Solution: 7.5 mmol/L in H2O is stable for at least 6 months at 2 to 8°C.